Having fallen in love with galbi, Korean barbecued pork, I naturally jumped at the chance to try the newly-opened Gyeong Bok Gung. This restaurant happened to replace one of the only places in Shin Jeju where one can eat bossam, or Jeju pork, wrapped in lettuce leaves. My expectations for Gyeong Bok Gung were at best neutral; my taste buds were already accustomed to the delicious honeyed soy sauce cutlets of the nearby Taehoo Galbi. Entering the foyer of Gyeong Bok Gung certainly did not shatter my expectations; in fact, it looked more like the inside of a fluorescent-lit office or warehouse. Aside from being put off by the plain-Jane interior of the restaurant, I found the service to be quite a redeeming feature. A waitress greeted me sincerely with a bow and ushered me to the table. Upon seating us the servers wasted no time, preparing the table with an array of banchan, or Korean side dishes. The little plastic trays contained bite-sized tidbits ranging from the standard kimchi to a garlic-spinach mash-up, a garden salad drizzled with strawberry-cream sauce, cold crab slathered in gochujang (red pepper paste) more decorative than edible, quaint quail eggs boiled in soy sauce, rings of onion fermented in dark vinegar and wondrously tender squid marinated in red pepper sauce atop a tiny round bed of snow-white sprouts. My fellow diners ordered the “yum-yum” galbi, or yamyeong galbi as advertised on the menu. Typical of the serve-quick-clean-quick philosophy, an iron pot of burning charcoal embers was immediately placed into the central pit, and tenderized sheets of marinated galbi promptly arrived at the table. 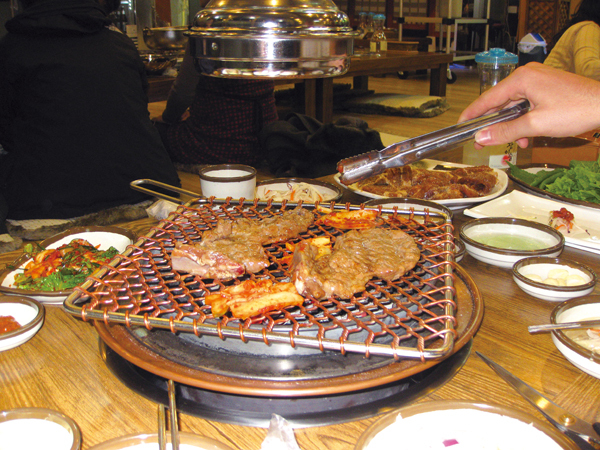 The galbi cutlets were sheared into manageable steaks and arranged on the steel net above the burning charcoal. The service staff seemed to dote specifically on our table. Whether it was from the assumption that foreigners did not understand galbi dining protocol or out of sheer kindness, not once was the meat left to char. Once cooked, the galbi was tender, juicy, and flavourful. Hints of garlic, ginger, honey and soy sauce were present. Eating the meat alone was satisfactory, but it was far more appealing to wrap bite-sized morsels of galbi in crisp lettuce or perilla leaf topped with a smear of ssamjang (red pepper and soy bean paste, sometimes with chopped green onion and raw garlic) and sliced garlic. The harmony of freshly-barbecued meat mingled with the crunch of fresh vegetables and smooth garlicky-spice certainly elevates Gyeong Bok Gung galbi above the norm. Safe to say Taehoo galbi has a contender to consider. To finish the meal, patrons were served sweet chilled apple cha. The price range is 3,000-5,000 won for drinks and 10,000-15,000 won for main dishes. The restaurant opens past noon and stays open until 11 p.m. It is usually bustling between the hours of 8 p.m. and 10 p.m. To reach Gyeong Bok Gung simply jump in any cab and ask for “Jeju Bossam”; if that does not work, ask the cab driver to call up the restaurant as it is a new franchise. Overall, the meal was satisfactory despite my fellow diners complaining of small portions. The atmosphere is family-friendly and the good service makes one feel at home. It cannot be called the Holy Grail of galbi experiences, but it will most certainly satisfy the craving of even tough-to-please galbi enthusiasts.